Cold As Ice is a fascinating runner as she makes her British bow in the 32Red Fillies’ Conditions Stakes at Wolverhampton. William Haggas has chosen this All-Weather Championship Fast-Track Qualifier to start off his South African recruit and if running up to her rating of 110, she would surely take all the beating. Formerly trained by Joey Ramsden, Cold As Ice was a dual Group Two winner in her native country before switching up to Group One level at Kenilworth, finishing second in what was her final South African start back in January. She had previously thrown away any chance of glory in the Cape Fillies Guineas when bursting through the stalls before the start, prompting connections to withdraw her after the daughter of Western Winter finally galloped loose. Bernard Fayd’Herbe was the rider in the plate and it is perhaps telling he is willing to make the journey to Britain to partner Cold As Ice. Among the best in South Africa, he should not find the Wolverhampton track too demanding. Clearly there is a question mark as to how the foreign form stacks up, but the established British runners appear to be an average bunch and Italian import Kyllachy Queen could be the major threat. Shamlan was snapped up by Kevin Frost for just £12,000 at the sales earlier this month and can waste little time in recouping a little of his price tag with victory in the Ladbrokes Handicap. Previously trained by Roger Varian, the three-year-old managed to win once in three starts, landing an admittedly moderate Catterick maiden on his second attempt before finishing second at Wolverhampton last time out. He was far from disgraced in that effort, just finding the winner a touch too quick, but he remains unexposed and should benefit from a longer trip. Three Musketeers can take a big step up on his fencing bow to win the Grade Two Fuller’s London Pride Novices’ Chase on day two of Newbury’s Hennessy meeting. 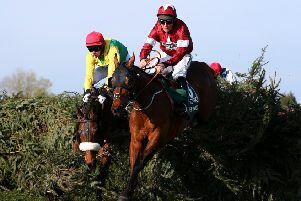 Dan Skelton’s string are in cracking form at present and this five-year-old could be an exciting addition to the novice chasing ranks after finishing third behind Nichols Canyon in a Grade One hurdle at Aintree on his final start last term. Admittedly he disappointed when sent off an evens favourite on his chasing bow at Huntingdon earlier in the month, but he looked in need of the run as he found little under pressure after the last. He kept on for third and is entitled to make plenty of progress for the outing, making him a leading player. Venetia Williams is another trainer whose horses are firing on all cylinders and Tenor Nivernais is a likely type as he makes a swift reappearance in the bet365 Open Handicap Chase. He shoulders a 6lb penalty after winning by 27 lengths at Ascot last week but even accounting for the extra weight, he is still 6lb well in on his revised mark and Williams is obviously keen to capitalise on that. Voix D’Eau is the pick in Doncaster’s Ice Cream Direct UK Handicap Chase, while Ten Trees can strike in the Mitsubishi Mares’ Maiden Hurdle at Musselburgh. Doncaster: 12.45 Terminal, 1.20 Lake Chapala, 1.55 Voix D’Eau, 2.30 Innocent Touch, 3.05 Cyrien Star, 3.35 Lynda’s Boy. Dundalk: 6.05 Victorious Secret, 6.35 Danz Gift, 7.05 Bittern, 7.35 Swift Harry, 8.05 No Biggie, 8.35 Reckless Lad, 9.05 Wheels Of Fortune. Musselburgh: 12.35 Touch Of Steel, 1.10 Ten Trees, 1.45 Throthethatch, 2.20 Raise A Spark, 2.55 Blades Lad, 3.25 Black Ink. Newbury: 12.25 Duke Of Medina, 12.55 Fourth Act, 1.30 Broxbourne, 2.05 Three Musketeers, 2.40 Tenor Nivernais, 3.15 Champers On Ice, 3.45 Mr Mix. Wolverhampton: 4.10 Kingsley Klarion, 4.45 Lamps Of Heaven, 5.15 Bush Beauty, 5.45 Royal Conoisseur, 6.15 Champagne Ceri, 6.45 COLD AS ICE (NAP), 7.15 Shamlan, 7.45 Manolito. Double: Cold As Ice and Broxbourne.